Maharashtra Gajraj Lottery monthly lottery scheme results declare every month's third week of the month or middle date of the month before last week. It has seen that the results of Maharashtra Rajya Gajraj Monthly lottery declare during the second last week of the month. The date is not fixed, however in between of the 15 to 25 date of the month. You can check the date of result on your print format lottery ticket where the actual results date is given. In this article, we talk about Maharashtra State Gajraj Monthly Lottery, Maharashtra Rajya Lottery schemes and how to check monthly lottery results online. Maharashtra Rajya or State lottery is one of the most famous and trustfully lottery scheme in our country, India. This lottery scheme is directly organize and manage by Government of Maharashtra State. There are number of lucky draws every week, days, months and by which government of Maharashtra gives an opportunity to be a lucky person everybody who participate in the draw by purchasing lucky draw tickets. Everyday, State government declares the results of special, day, weekly, monthly lucky draw results which can be available on official portal on state government lottery department. Maharashtra Gajraj monthly lottery scheme is one of the most popular lucky draw scheme by Maharashtra Rajya Lottery. We have also given information about another monthly lucky draw of Maharashtra State lottery name Maharashtra Sahyadri Lottery, which results declares every month's third week. Likewise Sahyadri Lottery, Gajraj Lottery also declares its monthly lucky draw on official website on the same day after luck draw. We have given information about Maharashtra Gajraj monthly lottery scheme, prizes, number of prizes and amount, how to buy lottery tickets online or offline, how to check results of Maharashtra Gajraj monthly lottery and other important details which you must know. 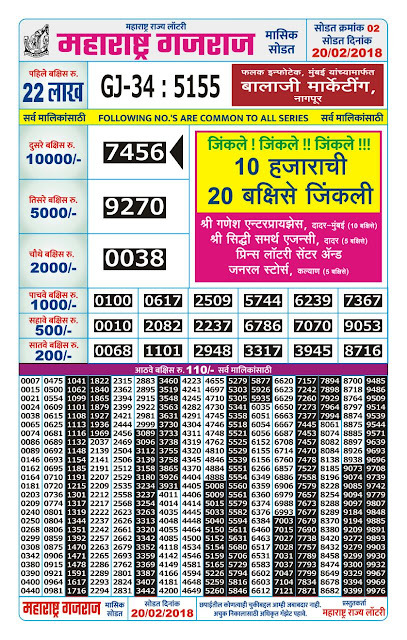 Maharashtra Gajraj Lottery also offers big bumper prize which can make lucky winner lakhpati. If you are looking for Gajraj lottery tickets, then you can easily find lottery stall, dealers, lottery ticket sellers which are available at marketplace, bus stand, railway station and city places. You need to purchase lucky draw ticket from those sellers to participate in the lucky draw which is organize by Government of Maharashtra. You should purchase those lottery tickets from authorized sellers only, as because you will need to contact legally when you got lucky and win any prizes from the list of prizes applicable to your ticket. I am not sure, whether lottery tickets of Maharashtra state government is available online. May be there is a facility which you can avail, but check official website only for any kind of information. How to Participate in Maharashtra Gajraj Monthly Lucky Draw Lottery Scheme? 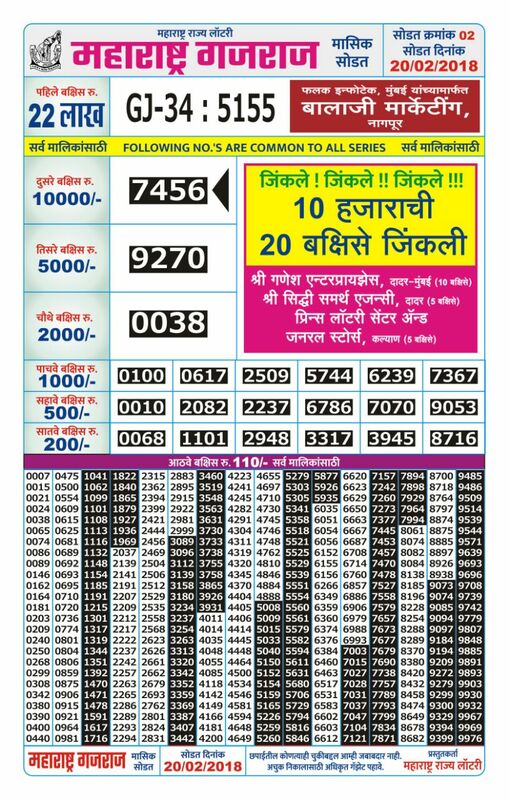 If you are really interested to participate in lucky draw contest of Maharashtra Rajya lottery, then you have to purchase lottery tickets from authorized dealers or lottery ticket sellers who are available in marketplace, bus stand, railway station or you may also find nearest lottery ticket seller contact address online. You have to buy the pre-printed lottery ticket from those sellers. There will be a bunch of lottery tickets at sellers stall, from which you have to pick randomly, any of your choice number which is lucky for you. Pay the seller lottery ticket charges and check the date of lucky draw. Now keep the ticket in safe place and wait for lucky draw date. You can find date of lucky draw on lottery ticket only. As mentioned above that, you have to remember the date of Gajraj Lottery lucky draw. You can check official website of state government lottery department of Maharashtra state at evening after 6 PM, where you can easily check the lucky draw Gajraj Lottery results online in PDF format. For that, you need to visit official portal of the lottery department. No other website may provide you the correct information, however many blogs can provide you the links to check official results. online. Check your lottery ticket numbers and match with lucky draw numbers twice to find what prize you have won. You can check Gajraj Lottery monthly draw results offline too! It is very easy to check lottery ticket results offline. Simply, visit the stall, authorized dealer from where you have purchase the lottery tickets and ask for Gajraj monthly lottery result. The seller will provide you official gazette which can be available at his place. You can match the lottery ticket numbers with official lucky draw numbers to find your prize. If your numbers matches, then you are eligible for that particular prize. If not, then try next time. May 2018 - Maharashtra Gajraj Monthly Lottery Results are available online. The Results of monthly Gajraj lottery for the month May 2018 is declare soon. You may check the official results of Maharashtra Lottery Gajraj Monthly scheme online and match your lucky numbers online and know which prize you have won this month. What are the Prizes of State of Maharashtra Gajraj Lottery Monthly Scheme? If you want to know about what are the prizes are awarded to lucky winners of Maharashtra Gajraj Monthly Lottery scheme, then below we have listed all the prizes with amounts awarded in this scheme. We would like to congratulate all the lucky winners who have won grand prizes in the lucky draw of monthly lottery scheme by Maharashtra Government. If you need any kind of help then post your queries regarding to lottery tickets and results. Comment below and we will try to help you in Maharashtra State Monthly Lottery Schemes and Results.